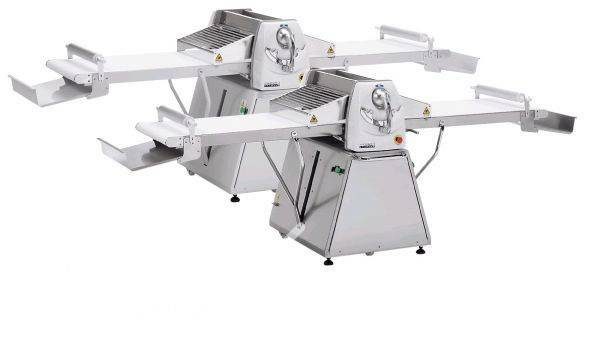 VA 650 is used for sheeting various dough types. VA 650 Rhas also a dough cutting device andн because of that also a two-speed motor.  The belts which are moved to the left and to the right during the working cycle can be switched on by hand.  The distance between the rollers is very precise and it can be manually or step wisely adjusted.  The flour for dredging the dough during the working cycle is stored in an easily removable vessel.  The machine is provided with a safety mesh, which switches the machine off in case of approaching with hands.  Machine’s cleaning is quick and simple.  When the machine is not in operation, the working tables can be lifted in order to use less space.